Complete video interviews of Flagler County School Board board candidates by the Flagler Exceptional Student Education Support Group. Four of the five candidates running for Flagler County School Board have served 24 years between them and want to serve more. The fifth has never been in office. “First and foremost, we must reassure our staff and students that our school buildings are safe places where we truly value and respect every single individual and do not tolerate bullying or hate speech,” wrote Jack R. Smith in a letter to parents of children in Montgomery County public schools. Myra Middleton-Valentine is a candidate for the Flagler County School Board, running against Paul Anderson, Maria Barbosa, and Sharon Demers. All registered Flagler County voters may cast a ballot in the Aug. 30 primary in this non-partisan race regardless of party affiliation. The winner will be decided on Aug. 30. Maria Barbosa is a candidate for the Flagler County School Board, running against Myra Middleton Valentine in the Nov. 8 runoff. Barbosa’s largely plagiarized answers to her first interview, when she unsuccessfully ran in 2014, are reproduced here, as she declined to be interviewed for the current election. Sharon Demers is a candidate for the Flagler County School Board, running against Paul Anderson, Maria Barbosa, and Myra Middleton-Valentine. All registered Flagler County voters may cast a ballot in the Aug. 30 primary in this non-partisan race regardless of party affiliation. The winner will be decided on Aug. 30. Paul Anderson is a candidate for the Flagler County School Board, running against Sharon Demers, Maria Barbosa, and Myra Middleton-Valentine. All registered Flagler County voters may cast a ballot in the Aug. 30 primary in this non-partisan race regardless of party affiliation. The winner will be decided on Aug. 30. Jason Sands is a candidate for the Flagler County School Board, running against Colleen Conklin All registered Flagler County voters may cast a ballot in the Aug. 30 primary in this non-partisan race regardless of party affiliation. The winner will be decided on Aug. 30. Colleen Conklin is a candidate for the Flagler County School Board, running against Jason Sands All registered Flagler County voters may cast a ballot in the Aug. 30 primary in this non-partisan race regardless of party affiliation. The winner will be decided on Aug. 30. The Belle Terre Swim and Racquet Club, created to help save the school board-owned facility, organized three political forums at the club without board permission, used a membership list to send out invitations in violation of board policy, and is not being charged the usual rate for use of facilities. 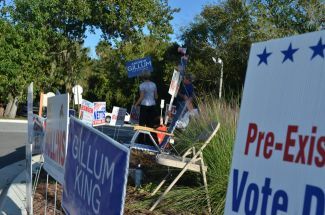 Underscoring the importance of turnout, All voters, regardless of party affiliation, may vote for Supervisor of Elections, School Board and Palm Coast council in the Aug. 30 primary, with the results in two of the three races deciding the outright winners. That’s assuming no one pulls the write-in ploy. The United Public Employees of Flagler County, representing 6 local public unions, hosted the largest simultaneous political forum in the county’s recent history, yielding a few insights into three races. With 21,000 votes in–early vote tallies and absentee ballots–County Commission incumbents Frank Meeker and Nate McLaughlin have taken commanding leads against challengers Howard Holley and Denise Calderwood, with Meeker polling 58 percent and McLaughlin close to 60 percent.